I don't know if it's the winter blues or what, but I've been questioning my ideas a lot (do I have any CLUE what I'm doing?!) so I kept waffling about a design for the kitchen backsplash. But then I realized hello it's a chalkboard wall and if I don't like it, it can be erased or even painted over. I gave it a shot and I'm so happy with the results! 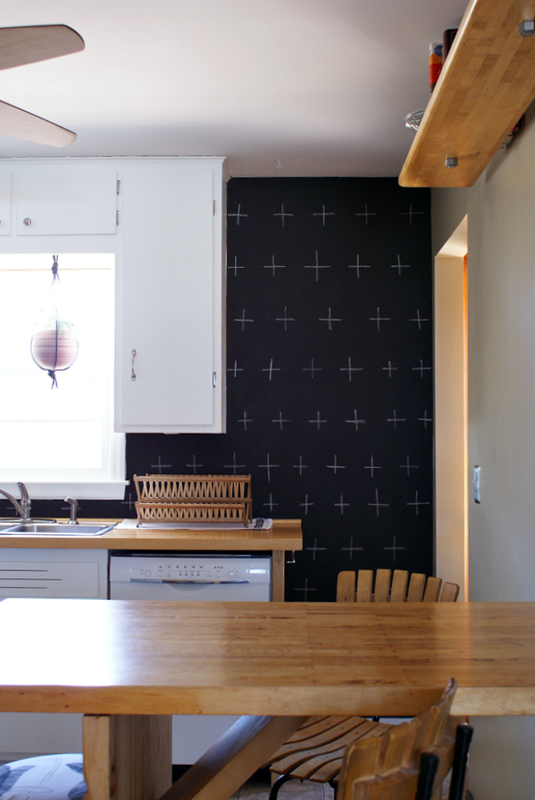 The plus signs are so fun; they and add a layer of interest and quirk to the kitchen. Confidence (somewhat) restored! I'm very fortunate to live within blocks of my office so I usually come home at lunch to let the dogs out and make a sandwich. Yesterday, while I was waiting for my grilled cheese (or Croque Monsieur, if you're fancy!) I ran out to the garage and grabbed one of Jesse's levels. Adding the plus signs to the back splash was super quick and I nearly finished before it was time to head back to work. I still can't believe what a difference the white cabinets make, the house is so much lighter and brighter! We don't have many windows (which I''m only recently noticing since I'm taking photos) and the white paint helps reflect the light we do have. Overall, I'm pretty happy with our budget makeover. This post has pics of how it looked when we moved in and where we started back around Christmas. If you have old dingy cabinets that you are considering painting, please give it a shot! It's tedious, but you can do it! So cute! 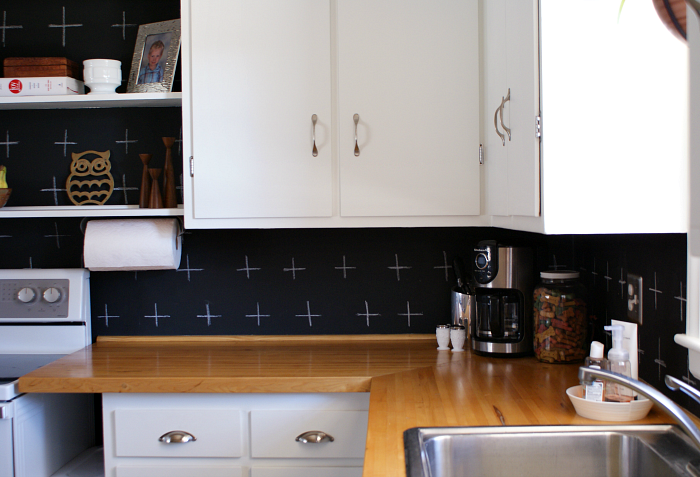 I love the plus signs and I really love your kitchen makeover! I'm hoping to get cracking on our kitchen this year. Step one is painting the organgey oak cabinets white. I can't wait to see how your kitchen turns out; I'm sure it will be lovely! Rachel, you are the most creative person! I love the ideas. Now, you need to help me update our Child Care Center! Thanks, Gretchen! I'm pretty stoked at how it turned out; the plus signs really kicked it up a notch! I LOVE this idea! So pretty and so cool! Pinned for my future kitchen :) Thank you so much for linking up at Thursday STYLE! I love that the entire wall is chalkboard and the plus signs are perfect! This winter has done the same thing to me - do I even know what I like anymore? Ack - cabin fever! Stopping by from Liz Marie. I LOVE this!!! !